Child has a knack for homing in on the important truths of kid experiences in entertaining ways, demonstrated here in the dynamics between Elmore and Albert and in the precise and pithy phrasing of Elmore’s observations. Elmore’s experiences will certainly resonate with older siblings, while younger ones may gain a bit of insight into their older sibs’ perspective.... Pair this Jenkins’ That New Animal (BCCB 3/05) for a look at the ways in which younger siblings change everything. A familiar theme—a big brother feels displaced by a new baby—seems fresh in Child's latest. ... It's a pleasing twist on typical stories about sibling rivalry, in that the little brother's actions change the dynamic rather than vice versa. Shared activities and playthings strengthen their bond, resulting in a happy ending for Elmore and Albert, whose name is finally revealed upon his big brother's change of heart. How nice to see a familiar story made new with a family of color and a little brother as hero. Fresh and amusing.... With expressive illustrations and a story that speaks directly to children, this picture book is beautifully crafted for reading aloud. Child is as funny and astute as ever, and it's refreshing to see a black family depicted in her stylish mixed-media art. What firstborn doesn’t revel in being thought of by his parents as “simply the funniest, cleverest, most ADORABLE person they had ever seen”? ... Child is no stranger to fraught sibling dynamics, and her trademark mixed-media collages—textured, fragmented, always with a kid’s-eye view—sympathetically reflect the experiences of a no-longer-only child. The selling point is the way Child frames Elmore’s growing love for his brother as the active, incremental discovery of the joy of companionship (“It was nice to have someone there in the dark when the scaries were around”), rather than treacly submission to the inevitable. The childlike perspective and simple illustrations will make this story a favorite for any kid who has ever been faced with a new sibling or has ha d to learn to share. Preschoolers will enjoy hearing this story, while independent readers will love the big print and colorful, cartoon illustrations. The common frustration of having a perfectly nice childhood ruined by an interloper—in the form of a baby brother or sister—gets a stylish reinterpretation at the hands of writer and illustrator Lauren Child in “The New Small Person." ... Here, in an atmosphere of humor and tenderness, we naturally sympathize with Elmore Green. 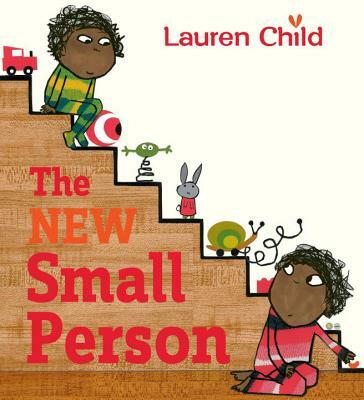 The New Small Person is a delightful tale of new sibling arrival and acceptance, another wonderful offering from the masterful Child. The playful illustrations, clever text design and placement, and carefully paced plot all help to convey Albert’s experience of embracing the expansion of his family. A fine story of sibling interactions and the move from only child to sibling invites young picture book readers to understand the presence of a younger child in the family.